In The Hague's Mauritshuis, the hushed atmosphere that builds up in front of Vermeer's Girl with a Pearl Earring is akin to that in one of the world's great concert halls when they're playing Beethoven. We know we're in the presence of greatness. As any reader of this blog should know, I am neither art historian nor much more than part-time artist. 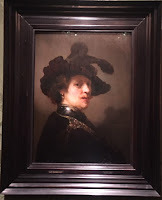 I'm a journalist, possessed of a good eye, a lifelong appreciation of fine art and design, and, after a recent visit to the Mauritshuis, an intriguing new theory. To try to imagine the 17th century and research the life and work of such celebrated Dutch artists requires open-mindedness as much as anything else. No-one really knows, for example, exactly how Vermeer came to such greatness, other than by painstakingly hard work. We can concentrate instead on the purpose of works such as his famous 'Girl'. The works themselves are often called 'tronies', anonymous heads or busts of no-one in particular, either 'ideal types' or stock characters with stock expressions. They were painted by many stars of the Dutch Golden Age. Indeed, most Dutch painters of the time, Hals and Rembrandt among them, painted them. Their purpose? Well, again, who knows? But for a painter with an important portrait commission, it could have made sense to have a 'practise run', painting a more extreme version of the head position or facial expression you wanted in the finished work. Rembrandt, indeed, is thought to have utilised his many self-portraits for just such a purpose. There may be a psychological reason too in that it could have been a way of calming nerves before painting someone as important as a monarch or top city dignitary – or to overcome what one might call fear of the blank canvas. Indeed, the ineffable calm of Vermeer's 'Girl', together with that of his other paintings, suggests this intrinsic meditative aspect. 'Tronie' (La trogne in French) is a rather pejorative term meaning face or 'mug'. Wikipedia gives a nice definition and shows several examples. Let's start our own investigation of the genre by examining one of Rembrandt's 'tronies', the painting known as 'Tronie' of a Man with a Feathered Beret. Here it is. The frame is a classic type, one that befits a Rembrandt. I've no idea how long the painting has been in this frame, or indeed if it had a frame of any kind when or before it was acquired by the Mauritshuis. It would be interesting to find out. One thing we do know from consulting the Mauritshuis website is that it was painted around 1635–40 and signed 'Rembrandt' rather than, as was more usual, with the painter's full name Rembrandt Harmenszoon (or Harmensz.) van Rijn. Whatever the painting's purpose, Rembrandt bestows on it all his usual mastery – look at that highlighted detailing on the leather collar. There's also a very fetching gold earring of what looks like a tiny dolphin hanging from a solid gold ring, part of which seems to pierce the man's ear lobe. Where did Rembrandt acquire such an ornament? During his successful years in Amsterdam, his popularity, and his many patrons and pupils made him extremely rich. However, if he had wanted to show this (not at all a Dutch trait by the way) he could have painted himself wearing the earring. Almost by chance, when I researched the work of Frans van Mieris the Elder (see entry below), I discovered that the Van Mieris family were goldsmiths. Well, even goldsmiths have to sell their work to put food on the table. Could not one purpose of the 'tronie' have been what the head or bust was wearing rather than the head in and of itself. 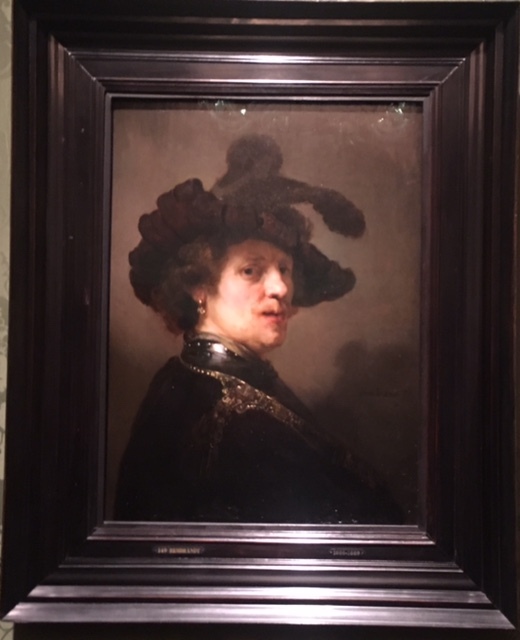 In the case of the Rembrandt it's a feathered beret, a stylish and rather jaunty one, possibly military apparel, and that earring. The overall effect is of a man of fashion, a man of substance. I can easily imagine a member of a merchant family like the Van Mieris family purchasing it (or indeed commissioning it), or its like, to hang in their place of business. Thus positioned it would encourage clients to see the fine effect of so-and-so's hat and a set of the Van Mieris company's solid gold earrings. Can you see the way my thoughts are heading? Girl with a Pearl Earring, exquisite and celebrated as she is, may have had much the same purpose. Let us pause for a moment. What seems at least to be agreed upon is that tronie paintings in their own time and for many decades afterwards were not accorded anything like the respect they are given today. They changed hands for a handful of guilders, the Dutch currency of the time, as opposed to what could be the hundreds paid for a portrait. Portraits of individuals or groups constituted the official records of the day. They were valued both by the sitters and the families or sponsoring organisations. This was especially the case if the head and/or the hands were by the master of the studio (something likely to be specified at the commissioning stage) and if precious metal such as gold leaf was called for. Let's look again at Girl with a Pearl Earring. She was painted in around 1665. She's wearing an exotic turban – a fashionable and sought-after garment at the time perhaps. The 17th century trading routes established by Dutch merchant ships made the Netherlands a world-beating economic as well as maritime power. The heavy silk coat or jacket she's wearing is an outdoor garment, certainly not a dress; it seems to have a hood. She's turning her head to look at the viewer: a last look, a goodbye look perhaps. Is she about to make a journey? What better parting gift from doting parents or a fiancé to his sweetheart than that whopper of a pearl earring. The fine jeweller who sourced the pearl and made that exquisite jewel would no doubt be well satisfied to have that image hanging in his shop. My tentative conclusion is that at least some so-called tronies were in fact not unlike shop signs, or decorative tiling or moulding on the outside of a shop alerting customers to the goods on sale inside. That they were an early form of visual advertising for interior use. None of this is to say that painters of tronies did not work from live models: they may just have enhanced the image – much like advertisers today. Please feel free to comment. You can now have a closer look at the paintings in the Mauritshuis permanent collection now that the museum has generously put high-resolution images online.